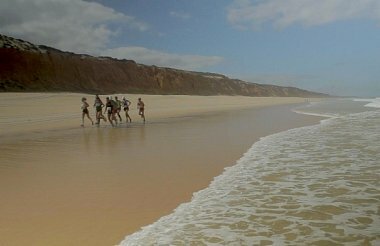 Atlantic Ultra Marathon Melides-Troia is an Adventure Race held annually by the municipality of Grândola, run through the sandy beaches of Troia Peninsula, on the West South Coast of Portugal, in Alentejo. 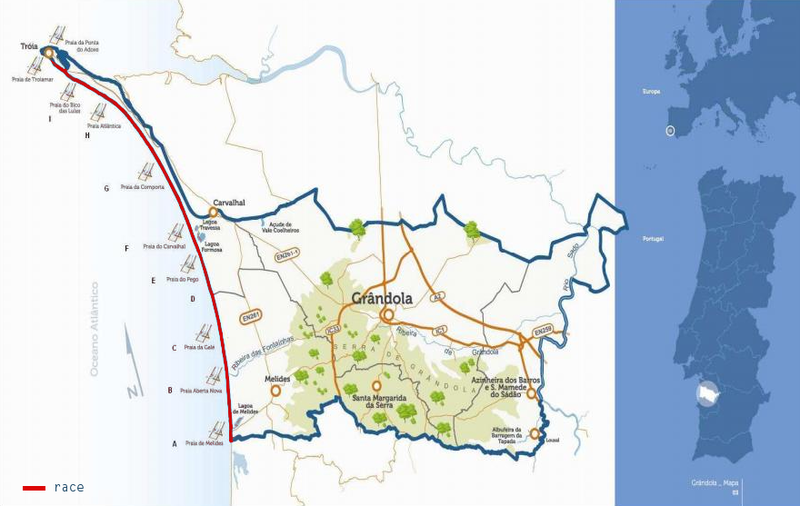 43 kilometres that quantitatively measures the distance between Melides and Troia, along side the Atlantic Ocean. A unique competition in all Europe, not only by the nature of the ground it stems but also to happen in an area of outstanding natural beauty with one of the least man made intervention in the all continent. This coastline is the 3rd biggest continuous sand bank in the world. 77 km of a long sandy beach from Sines to Tróia, framed by Arrábida sierra, the immense ocean and a landscape made of dunes, falésias and pinewoods. The perfect scenario to held this physical and psychological endurance race. Sponsored by the Olympic Marathon Champion of the 1984 Los Angeles Games, Carlos Lopes, this race has a set of special features: the athletes may only receive 1 liter of water throughout the run and must carry with them, from the beginning until the end of the race, all the supply’s they intend to use. The organization supplies the athletes in the starting zone with 1.5L of water, one piece of fruit, a gel and an energy bar. On arrival at the finish line, the athletes have access to liquids and food reinforcement. Annually, the date of the race, always in the second half of July, is defined in accordance with the tidal prediction, as low as possible, in an attempt to minimize the physical and psychological hardness of it.